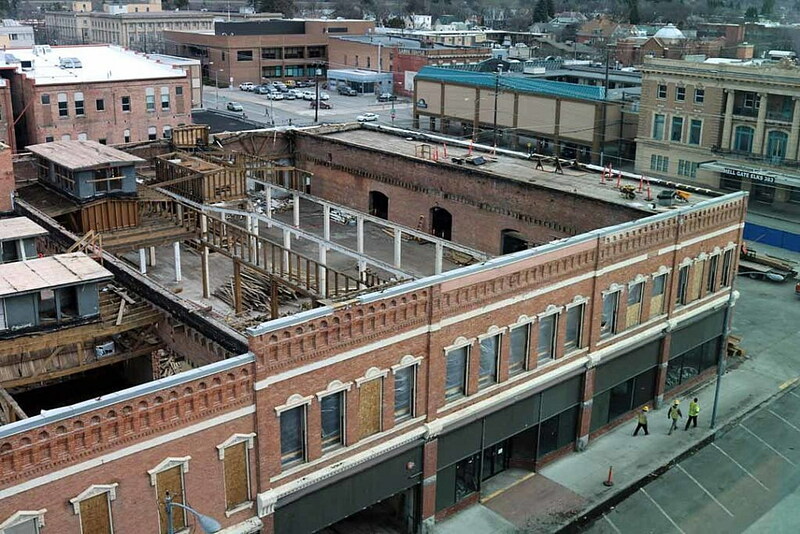 The spring rain will find few obstructions as it falls over the Missoula Mercantile, with some drops now making their way to the dusty basement without interference. Deconstruction crews with Home ReSource continued to dismantle the downtown building this week, and expect to have the salvage job completed by April. The building’s roof is gone, along with the floors below it. Looking down from the top floor of the First Interstate Bank building, the “Murky Merc” – as one City Council member described it last year – now resembles the skeleton of a 17th century galleon propped up by a rickety brick veneer. The work began earlier this year after a Missoula District Court judge settled a lawsuit filed by a group of preservationists looking to save the building, and it has gone quickly, according to Nuckolls. The windows have been removed, along with the grand staircase and other prized materials. While the rafters remain in place, the building is now open to the sky above. It’s too soon to estimate the quantity of materials removed, though Nuckolls is confident that his 15-man crew has removed tens of thousands of board feet of rough-cut lumber, including a number of 2-by-16s. Nuckolls said that amount of rough-cut lumber is rare, with most of it resembling turn-of-the century milling techniques. It’s these “face materials” that his crew is working to salvage for potential reuse in the Mercantile hotel planned for the downtown corner. Salvage crews will store the face materials throughout the deconstruction process. Nuckolls said Home ReSource has been charged with preserving the items, ensuring they’re logged for consideration in the design of new hotel. Any materials not included in the new structure will be sold to the public at Home ReSource. Some of the lumber could be available in the next few months. Once the deconstruction work is completed in the next few weeks, Nuckolls said heavy equipment will arrive on site and begin to bring down the brick exterior. A brick giveaway has been discussed, though the details haven’t been finalized. Nuckolls said the deep foundation – nearly half a city block – will then be backfilled, setting the stage for new construction. The trick, he said, is to do the work while leaving the old pharmacy section of the building intact. That portion of the structure faces Higgins Avenue and has yet to be touched. The developer, HomeBase Montana, was required to place a deposit to ensure the pharmacy is saved. Taking the old Mercantile apart piece by piece has revealed a surprise or two, such as a poem written in 1909 by someone getting married, and old paper adverts dating back to a bygone age. Yet anything hidden inside the building by past city residents likely disappeared several years ago when crews attempted to prepare the building for reuse, Nuckolls said. Nuckolls said the developers will look to include the historic finds in the new building, which will include a Mews, or interior museum. The feature is planned as part of the five-story Marriott hotel, along with ground floor retail and dining, and a second-floor pool. For Nuckolls, who’s been in the deconstruction business with Home Resource for four years, the Mercantile represents his largest project to date. The business is run like any other, and Home ReSource has learned to compete with others in the growing deconstruction industry. Contact reporter Martin Kidston at info@missoulacurrent.com.